The best homemade burgers that you can’t actually make at home. Once a secret haunt of those in the know, the iconic orange caravan of Ekim Burgers recently packed up and moved into the big kids’ food club on Cuba Street. In fact, we’ve been a bit reluctant to share it with you. It’s our best-kept not-so-secret secret. ‘Ekim’, if you hadn’t already snagged, is the owner’s name backwards. Ekim had humble beginnings, tucked away at the far end of Lyall Bay in the car park where usually only surfers and dog walkers dared venture – until word got out about the burgers. Now, it attracts all walks of life. Fresh, delicious, and cheap, Ekim offers the best homemade burgers that you can’t actually make at home –trust us; we tried. The caravan kitchen is both a blessing and a curse; while the food that it produces is unbelievably tasty, at peak times the wait can be pretty horrendous. But with such affordable prices, it’s definitely worth the wait. Time is money and you definitely get what you pay for, if not more. 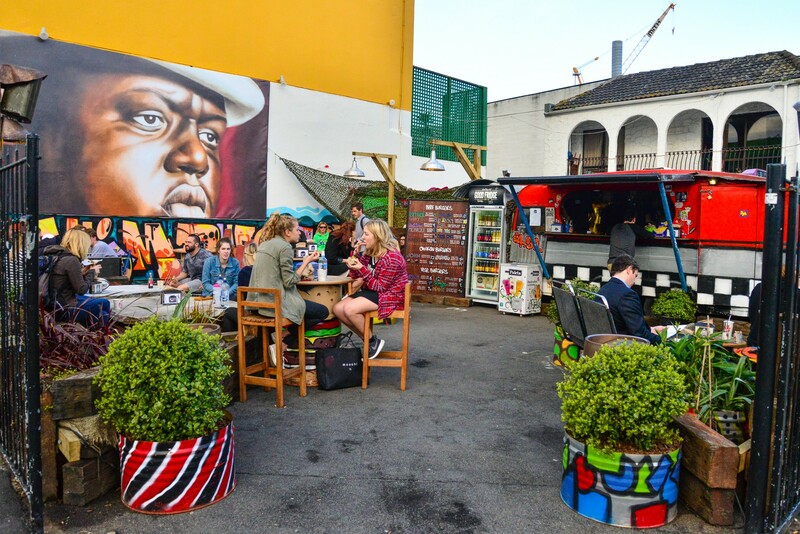 While there are future plans in place for covered seating inside shipping containers, the seating currently on offer is limited and uncovered. The tables painted as burgers are pretty cute, though. The jury’s out on which of their burgers is best, but with 26 on offer, there’s something for everyone. Or should we say someone for everyone? All burgers on the menu are named after people (it’s a little awkward and also a little thrilling ordering a “Mum”). All beef burgers come with cheese, Ekim sauce, mustard, and salad. Little Mike ($11), with double beef and double cheese, is a classic. The fillings are basic and non-fussy; making it all the more confusing that you can’t replicate the insane goodness at home, no matter how hard you try. There’s no room to beat around the bush with this one: You have to get fries. A pottle of homemade potato fries, or more accurately described as potato cubes, with the spicy (but not too spicy) tomato Ekim sauce and your life will never be the same again. Luckily for you, you can now buy the sauce ($6) in a bottle to take home with you. While we miss Ekim's old beachside spot, the convenient location on the corner of Cuba Street and Abel Smith Street means that the burger joint is more accessible than ever for when those sudden burger cravings set in.